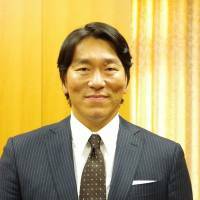 Former Minister of Education, Culture, Sports, Science, and Technology Hiroshi Hase, sat down for a chat with the Japanese baseball legend Hideki Matsui, who was appointed March 21 as an ambassador for the World Forum on Sport and Culture. The discussion was moderated by Kumi Fujisawa, an advisor to the ministry and the head of the Office of World Forum on Sport and Culture. Hideki Matsui is a retired professional baseball player who played for the Yomiuri Giants in Japan and the New York Yankees, the Los Angeles Angels, the Oakland Athletics, and the Tampa Bay Rays in the U.S. Upon retirement, he received the People’s Honor Award in 2013 in Japan. Hase: Tokyo is set to become the first city in the world to host both the Olympics and Paralympics for the second time. Toward 2020 and beyond, Tokyo will become a city of diversity. The roads, facilities, everything will be universally accessible. I believe Japan has such technology and innovation, where most other countries do not. I believe such innovation is rooted in the Japanese spirit. In order to spread this message, I wanted someone who enjoys widespread popularity and has an international background to promote our cause as ambassador. This person must also believe in our goals and values. Mr. Matsui, that is exactly what I saw in you when I asked for your help. Matsui: It’s my honor. I’ve played on both Japanese and U.S. soil and my experiences made me realize the strengths and good things about being Japanese. This is a good asset for me as an ambassador and I am thankful for having the opportunity to spread the message through events. The good things about the Japanese also include our culture, and I believe that you can trust me in conveying such messages. Hase: Japanese baseball seems to put emphasis on teamwork. Do you think that is also the case in the U.S.? Matsui: As to how to establish both personal achievement and team achievement, I don’t feel there is any difference between Japan and the U.S. Players are pretty much respected by everybody and they think of a team victory as their top priority. Of course, it is important as a player to brush up your skills, but once you are in uniform, you must pursue team victory. Such an attitude earns respect both in Japan and the U.S. I think there is no difference on this point. Fujisawa: Why did you establish 55 Baseball Foundation (to help spread the popularity of baseball)? Matsui: First, the baseball population has been declining in both Japan and the U.S. I want to teach children how wonderful baseball is and want them to play, continue to play and become better. By doing so, I also learn a lot. By dealing with both Japanese and American children, I’m learning the differences in how they treat me. It’s a very interesting learning experience. Fujisawa: Do you have a message for children playing sports? Matsui: Sports are a great way to learn many important lessons. You can learn from the sport, as well as your teammates, coaches and supporters. Hase: Sports can serve as a huge starting point. Through sport, we learn to respect each other, to abide by the rules and play fair. I was always told that, and I also learned to take good care of equipment. There are many things you can learn other than the sport itself. Matsui: I remember a time when I threw a bat at an international game in high school and my coach being very angry. I also remember that my coach praised me for not criticizing the opponent team after a pitcher walked me five times when I was in high school. I remember being praised for my attitude more than my skills. Hase: We really appreciate your contribution to sports since your retirement. I hope you can help us facilitate more dialogue between businesses, academia and teachers to improve sports, and I personally support you becoming a professional coach. I truly believe you will become a person with a genuine dual career, who has first-class manners, knowledge and expertise. Fujisawa: What do you expect to come from the World Forum for Sport and Culture? Matsui: I hope this raises more interest in sports. I’m also looking forward to promoting the good deeds of the Japanese, and the good aspects of sports in Japan. It is a major event for us in this area, and I hope we can keep the passion and tempo high even after the event is over. As the top batter, I hope to put in my best to make this event successful.